SERGEANT KUP is one of the most experienced soldiers in the AUTOBOT army. There’s a rumor among younger AUTOBOTS that he’s laserproof. The aging soldier has a habit of walking calmly through even the thickest crossfire to deliver advice or encouragement to raw recruits cowering under cover. The robots that serve under him think he might have a screw loose somewhere, but they’d still gladly follow him anywhere. His commanding voice and centuries of experience are an inspiration to everyone who meets him. Converts from robot to vehicle! The AUTOBOT soldier SERGEANT KUP converts from awesome truck to a veteran of hundreds of battles and back. His cannons snap on to get him ready for any battle situation you can imagine. Battle him against your other TRANSFORMERS figures! Includes: Converting SERGEANT KUP action figure and 2 snap-on cannons. Features: • Snap-on cannons! 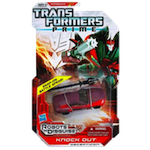 • Includes DVD with full TRANSFORMERS PRIME episode, "Loose Cannons"!